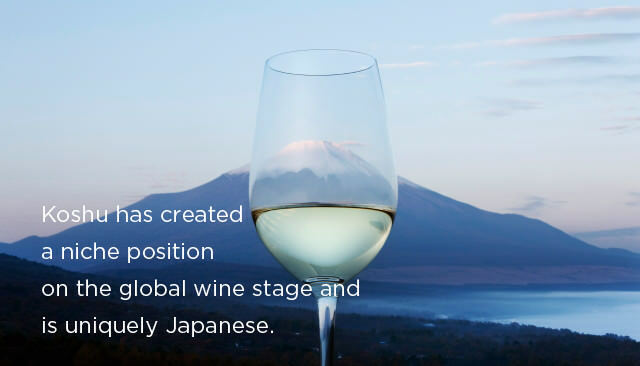 The vineyards of Yamanashi lie at the foothills of Mount Fuji, the majestic mountain, which is one of the magical symbols of Japan and also a World Heritage site. Approximately one thousand years ago, the Koshu grape travelled along the Silk Route and found its Japanese home in the Prefecture of Yamanashi. Koshu of Japan, (KOJ) was established in 2009 to promote and improve the quality of Koshu, and through its efforts, the wines continue to gain recognition in international markets. Koshu of Japan (KOJ) is an organization established in July 2009 by fifteen Japanese wine producers from Yamanashi Prefecture, Japan’s premier wine-growing region. In addition to the producers, the partners in this organization are the Koshu City Chamber of Commerce, the Kofu Chamber of Commerce and Industry and the Yamanashi Prefecture Winemakers Association. This organization aims to improve the quality of Japanese Koshu grapes and wines and to increase their awareness on global markets. In 2010 KOJ launches a campaign in the UK as the first step of an EU-wide promotion. KOJ is working with Master of Wine, Lynne Sherriff, a world-class authority on wine, to provide marketing advice and technical guidance on promoting Koshu in international markets. there have been experiments with vertical shoot positioning which are very promising. Long cordon pruning has also been tried as an alternative to the traditional Japanese pruning technique. Significant advances have been made in limiting yields and focusing on canopy management. International expertise has resulted in marked improvements in quality. Today the versatile Koshu produces a wide range of still and sparkling wines, from bone dry to sweet. Koshu berries form long distinctively pinkish grey clusters. They are thick-skinned making them fairly resistant to disease. The grape belongs to the European Vitis vinifera family. The aromatics are delicate, with notes of Japanese citrus and savoury, minerally flavours. The wines are delicate, restrained and low in alcohol and their clean, racy acidity results in a crisp and polished finish. Koshu is very pale in colour, with delicate aromas of citrus and white peach. making them an obvious choice for subtly flavoured dishes. which is inspired by fresh seafood, light meats and vegetables. They have a linear Zen-like quality which is all about balance. Copyright © 2017 KOSHU OF JAPAN. All rights reserved.